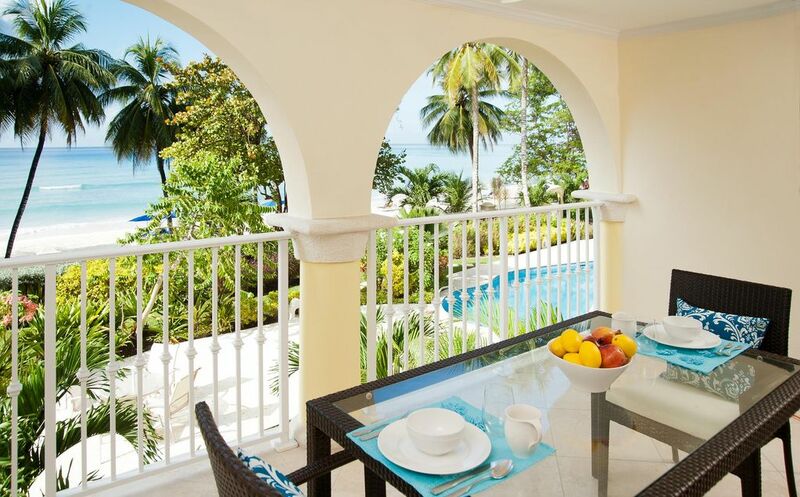 At this beautiful duplex condo on the south coast's Dover Beach, arched columns frame dreamy Caribbean Sea views, and 1600 square feet of elegant indoor/outdoor living space create a spacious haven on the shores of Dover Beach. The Sapphire Beach Condos complex, where the condo is located, is both within walking distance to the shops and restaurants of St. Lawrence Gap but also tucked away from the busy-ness of the Gap. Inside the condo, high-end details create an exceptional place to stay—from luxury sheets and towels to rich wood furnishings and sophisticated fabrics in a palate of pale turquoise and sandy taupe. In the striking modern kitchen outfitted with stainless steel appliances and granite countertops, you can whip up a quick meal or create a gourmet feast. Both find a fitting setting at the open-air dining table on the patio facing the dynamic sea—the water here on the south shore of Barbados changes colors with nearly every hour of the day. The sunsets are particularly phenomenal, and you can enjoy a sunset dinner without even leaving your condo. The two bedrooms at Sapphire Beach #117 each have their own attached baths (no fighting over the showers). Because there is one bedroom on each level—a king-sized master upstairs and two twin beds on the ground level—families with older kids find this to be a great setup for both shared family time and privacy. The ground-level bedroom features a big patio door that opens to the pool and the beach for easy water access. Even the bathrooms are beautiful. Because Sapphire Beach Condos are just a hair over 5-years old, everything sparkles like new. Have questions about Sapphire Beach #117 or its surroundings? Don’t hesitate to contact me. I love helping people experience the very best of Barbados and the St. Lawrence Gap. Or if you’re ready to book your trip right now, let me know when you’d like to come and we’ll put your name on the calendar. Greetings from beautiful Barbados! I am an American lucky enough to have met and fallen in love with a wonderful man from Barbados. Actually, I fell in love not just with the man but with his beautiful island home. The views of Barbados' Caribbean Sea are stunning. Access to beautiful Dover Beach is right outside. The apartment is a spacious 2BR 2BA in 1680 s.f. on two levels ~ and it has 3 outdoor patios, laundry inside the unit, private parking, and outstanding security. Location, location, location. Beautiful Dover Beach is directly outside your back door at #117 Sapphire Beach Condos and Restaurant Row is just a few steps outside your front door. There's also a small market across the street and little shops galore. You don't need a rental car in order to have a fantastic holiday here. My girlfriend and I had a lovely stay at Sapphie Beach. The unit was very nice and had everything we needed and wanted. We really enjoyed the balcony! The property had a lot of construction and maintenance going on which was expected as we visited during an off-busy time and that was the time repairs were made to the building and property. The pool area was very nice and we only enjoyed the beach that is right behind the pool one day as the seaweed was terrible. The location is right on the Gap which was fun but the constant money traps and nonstop street vendors trying got a little old at times, but that comes with the Gap. The bars were very fun with live music at most places. The food places we went to were mixed as we enjoyed some places over others. We spent a week in unit 117 with our two grown kids. Fantastic floor plan for older kids or two couples. There is a bedroom/bathroom on each floor. We enjoyed breakfast there every day, and cocktails on balcony each evening. The unit was clean and comfortable. We'll be back! The property was clean and well maintained. All of the equipment was in good working order. The agent, Jane Shattuck, was friendly, available, helpful, and professional. We enjoyed our stay and would recommend this property to others. First rated location for beach access, restaurants, shops. The beach is literally 2 mins away from the condo. The pool is a bit small but enough for our kids to have a dip in after spending time in the ocean. The condo is clean, bright and well equipped for what we need during our stay. Jane and Monica were welcoming, very helpful with lots of recommendation which all turned out to be great and accommodating our late check out request. Overall we really enjoyed our stay at the condo, and already planning our return! I so appreciate your return to #117 Sapphire Beach Condos, Susan. Thank you for making this pretty property your home away from home in Barbados. Condo was very nice. Only difficult thing was getting luggage up the stairs . Bed was very comfortable. Bedroom next to road but we slept with ear plugs. Balconey was beautiful. Had view through palms of water . We could hear the waves. Great! There were eating places close by. Abby our housekeeper was very helpful. Monica who met us at condo was helpful and quickly took care of a few problems. Overall a great destination and very enjoyable. It was lovely having you here in Barbados :) Yes, there's some exercise getting the luggage up the stairs .. but after that, there's rest & relaxation (& rum?) in the sun, while, as you say, enjoying the sweet sounds of the sea. I'll pass on your kind comments about Abby and Monica; these wonderful women want guess to be as comfortable as possible. Thanks for mentioning them both.